Russia’s fastest high-speed train runs on the Moscow-St. Petersburg line, and made its debut in December 2009. The German-built Velaro RUS trains, also known as the Sapsan, have cut the travel time for the 401-mile route from eight hours to three hours and 45 minutes. The 10-car passenger trains operate at a maximum speed of 155 mph, but hit a speed record of 175 mph during trials in 2009. 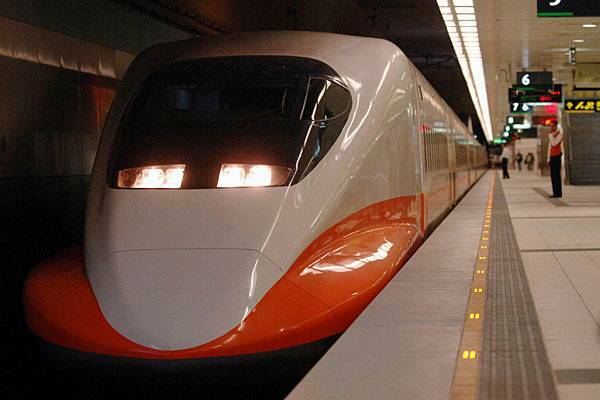 The eight high-speed trains are worth nearly $1 billion. Russia is eager to expand its high-speed rail network ahead of hosting the 2018 FIFA World Cup. The country has invited foreign investors to bid on development contracts for new lines that will link its cities. Taiwan’s high-speed rail project, which cost a total of $18 billion, is one the world’s largest privately funded rail construction plans. The country’s THSR 700T trains have cut travel time from 4.5 hours to 90 minutes on the 214-mile route from the northern capital of Taipei to the southern city of Kaohsiung. The 30 high-speed trains, which began operations in 2007, are based on the Japanese 700 Series Shinkansen “bullet train” model. A record 36.9 million passengers rode the trains in 2010, a 14 percent increase from the year before. The country’s high-speed rail system has been making headlines recently after the government said the network might not last more than 10 years because of sinking land caused by the overuse of groundwater. Last month, the government said it would cap deep groundwater wells that threaten the structural base of the high-speed system. South Korea’s high-speed rail network, known as Korea Train eXpress (KTX), carries more than 100,000 passengers a day on its two lines. In April 2010, a record 178,584 people used the country’s high-speed rail network. 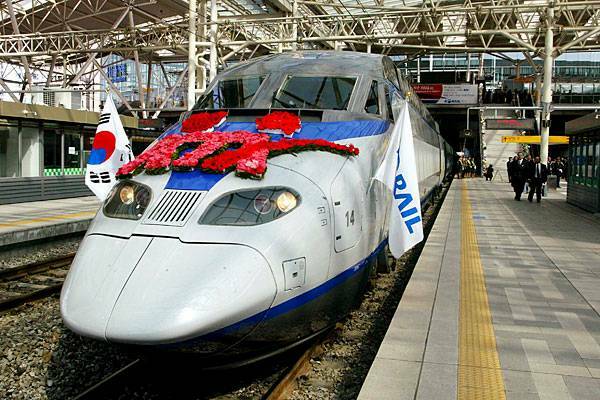 After 12 years of construction, the first high-speed line was opened in 2004, slashing travel time from the capital Seoul to the port city of Busan to two hours and 40 minutes, half the time it took previously. The travel time between the two cities was reduced by a further 22 minutes when a second line was opened. The Eurostar has changed the way Western Europeans travel. Since it began operations in 1994, the London-based high-speed rail network connects England with cities in France and Belgium via an underground tunnel in the English Channel, often referred to as the “Chunnel.” With 27 trains and links to more than 100 destinations across Europe, the network marked its 100 millionth passenger in August 2009. The rail line carries passengers at speeds of up to 186 mph. The Eurostar 3313/14 broke a British rail record set in 1979 by reaching speeds of 208 mph in 2003. The rail network was recently taken to court by French train-maker Alstom over its decision to give a $600 million contract for 10 new trains to German builder Siemens. However, a U.K. court rejected the application to have the contract suspended. 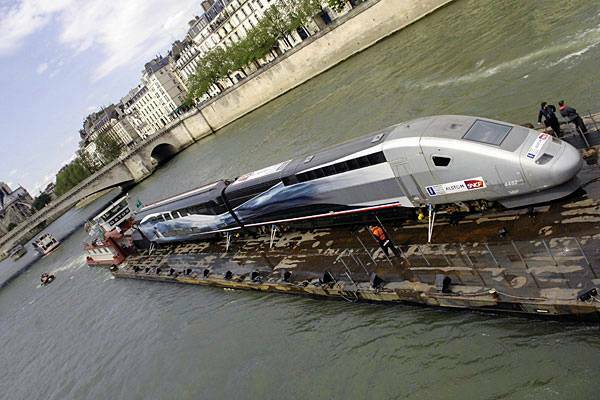 Alstom is the world’s second biggest train maker and the supplier of all existing Eurostar trains. One of the early pioneers of European high-speed rail technology, Italy is home to Europe’s first high-speed train line. The Florence-Rome high-speed line made history when more than half of its entire length—the first 86 miles from Rome to Citta della Pieve—opened in 1977. Trains on the track reached a maximum speed of 160 mph. Since then, the country’s high-speed rail network has grown substantially, with high-speed lines reaching as far north as Torino to as far south as Napoli. The Italian-made ETR 500 is the fastest train series in the country, with its ETR 500 Y1 model hitting speeds of up to 225 mph in 2009 on a trip between Florence and Bologna. Not everyone is happy with the progress, however. Earlier this month, more than 200 people were injured in a rally against the construction of a planned 36-mile tunnel in the northern Susa valley that would cut three hours off the current seven-hour train journey between Paris and Milan. Protesters say the high-speed line will ruin the area and its construction could release harmful chemicals. 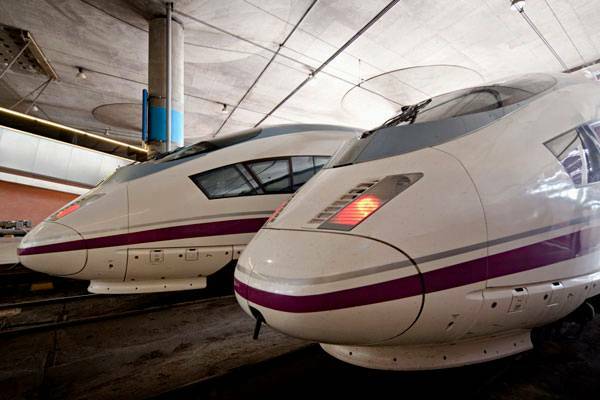 Spain has the longest high-speed rail network in Europe, with 3,433 miles of tracks. With six high-speed train lines and several under construction, the Spanish government aims to have 90 percent of its population within 31 miles of a high-speed station by 2020. The country’s fastest trains are the AVE series, which is manufactured by several train makers, including Siemens, Alstom and Bombardier. The Siemens-made AVE Class 103 train began commercial service in 2007, and hit a record speed of 251 mph during a test run between Madrid and Zaragoza. The maximum top speed for commercial trains in Spain is limited to 186 mph for passenger safety. The euro-zone debt crisis and Portugal’s austerity plan have halted a major expansion plan, which would have linked Spain’s capital Madrid with Lisbon in Portugal. The high-speed train link would have cut travel time between the two cities to two hours and 45 minutes instead of the current nine hours. Germany is a nation that has been at the forefront of high-speed rail technology. It’s home to Siemens, the world’s largest manufacturer of high-speed trains. German companies Siemens and ThyssenKrupp have developed the Transrapid system, high-speed monorail trains operating on magnetic levitation (Maglev) technology, that can reach speeds of 311 mph. In 2004, the Shanghai Maglev train in China was the first commercial Transrapid train to carry passengers, hitting speeds of 267 mph. 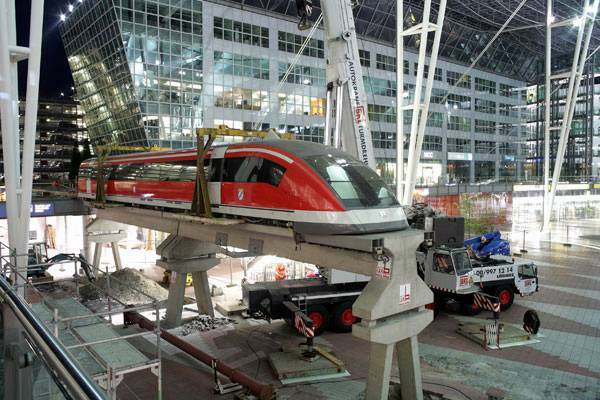 Although the magnetic levitation trains are developed in Germany, they have never been used commercially in the country. The technology has faced several setbacks, including high costs and a crash that killed 25 people during a test run in 2006. Instead, the InterCityExpress (ICE) system has been adopted nationwide since 1991. These high-speed trains hit speeds of 199 mph and connect German cities with cities in Switzerland, Austria, Belgium and the Netherlands. An ICE train disaster near the German village of Eschede in 1998 is considered the world’s deadliest high-speed rail accident, leading to the deaths of 101 people. It also boasts the longest high-speed rail route, with the opening of its Beijing-Shanghai line earlier this month. The 819-mile route was made using 60 million cubic meters of concrete, twice the amount used in the Three Gorges Dam. 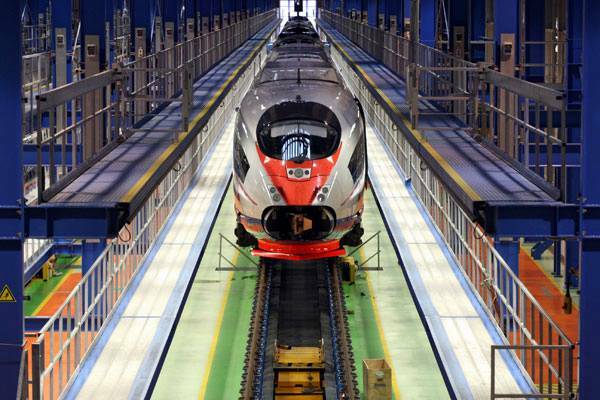 While the CRH380AL trains operate at a speed of 186 mph, the train hit a record speed of 302 mph in a test run. China’s first high-speed line, which opened in 2007, saw 40.6 million passengers travel on it in just the first two years. 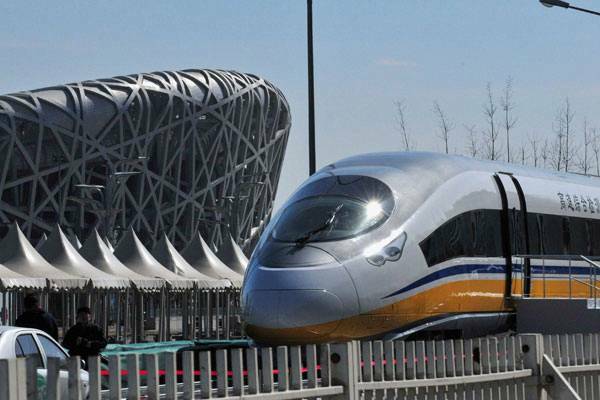 The government hopes to stretch China’s rapidly growing high-speed network to 28,000 miles by the end of 2015. The first Alstom developed TGV trains hit the tracks in 1981, with service between Paris and Lyon. Since then, the network has expanded to service 150 destinations within France and neighboring countries. Limited to a speed of up to 200 mph during normal service, the experimental TGV V150 hit a record speed of 357 mph in 2007—making it the second fastest train in the world. 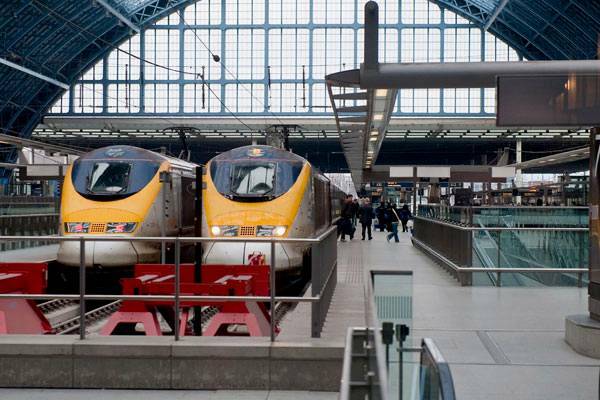 TGV’s high-speed technology is used in national trains in many European countries including the U.K., Belgium, the Netherlands, and Germany. Last month, French train maker Alstom signed a preliminary deal to build a high-speed rail line in Iraq linking the cities of Baghdad and Basra. Japan is the world leader when it comes to high-speed trains, opening the world’s first modern high-speed rail in 1964. The Japanese first made a breakthrough in the field when they introduced the first series of the Tokaido Shinkansen “bullet trains,” which could reach a top speed of 130 mph. The early bullet trains carried more than 100 million passengers in just the first three years. Today, the trains are still operating on the world’s busiest rail line, carrying 378,000 passengers a day. 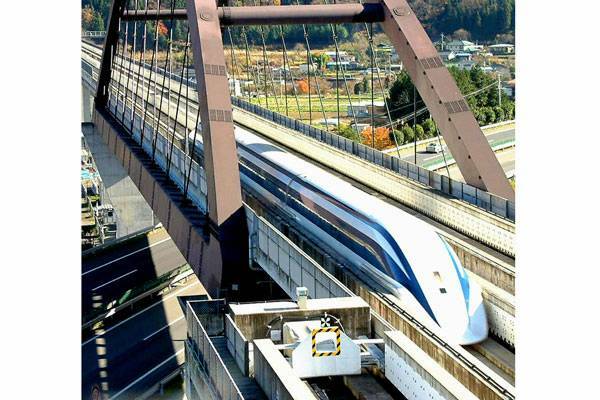 Maglev trains have also been developed in Japan since the 1970s. The government has approved plans for a $112.4 billion project to build a Maglev train line between Tokyo, Nagoya, and Osaka, with a completion date of 2027. These planned high-speed trains are expected to cut the current travel time between Tokyo and Osaka from two hours and 18 minutes on the Shinkansen to just over an hour. Currently, the experimental JR-Maglev MLXO1 is considered the world’s fastest train, with a top speed of 361 mph in a test run in 2003.